Following the basic code of ethics plays a great role in obtaining good results in Reiki . This holds true for all medical practices- be it allopathy, homeopathy, naturopathy or any other system. Energy is universal and is never-ending. Therefore, energy healers have a task of using this pure form of freely available and abundant source in healing purposes and uplifting the quality of life of those who approach them. The sense of purpose is therefore very important. A Firm Belief System– only when you have the faith in yourself can the mind, body and the soul responds positively and move in the direction as desired. Unflinching faith can only come by regular practice and goodwill on part of the healer. Following the Right Path – before anyone becomes a healer, it is important to change the lifestyle from that of consumption to a more giving one. Thus, one is expected to follow the principal of Yamas and Niyamas. Many so-called healers or masters do not even know what these principles are, leave alone following them! Reiki is pure energy. It is divine and freely available. There is no governing body, no control, no method of checking anyone’s authentication of the claims. Hence many people see an opportunity in this and declare themselves as masters by obtaining certifications from equally dubious persons and websites. They then start charging exorbitant amount from people and justifying it! Many people thus obviously get disillusioned by the results they achieve. They stop having faith in energy healing, and are often seen venting out, brandishing it as fake. 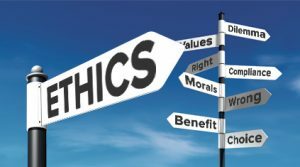 Following these Ethics in Reiki thus assumes a greater significance. Remember, it is not the energy healing method that is fake but it is the wrongly selected teacher the master or the grand master who is fake. It is therefore very important to select a Reiki Master after a lot of deliberation. I fully agree with u. I met or talked a few n find not master in reiki but master in making money..Healer should have cifidence in hinself then the recievers.The intention of healers work more effectivly then reciever as he is already sick. I gone through paid with no benefit in return.